Meet four ex-cops who left their badges behind to pursue their entrepreneurial dreams. In May, Gina Scarda was sergeant of the New York Police Department's Technical Assistance and Response Unit. Just six months later, she has three new titles taking the place of sergeant: franchise owner, holistic health counselor and stand-up comic. Law enforcement officials like Scarda, 46, face a variety of stress on a daily basis. Whether it comes from juggling their family time with their unusual patrol hours, delivering news of death or dealing with internal department issues, being a police officer is a high-stress job. So it's understandable when one of the force leaves to start their own business. Despite the stress, it can be a tough profession to leave. "When I joined the Los Angeles Police Department, I gave myself five years. But it turned into 13," says 39-year-old Kelly Chrisman. The former cop, who joined the LAPD at the age of 21, says his parents worried about the dangers of the job, but he wanted to fulfill his childhood dream. By 2003, however, Chrisman was fed up with what he calls "dysfunction" in his department and was ready to move on. That's when he began thinking about becoming an entrepreneur. Chrisman thought back to the lack of technology in the courtrooms when he worked as a liaison with the city attorney's office. "I realized there was so much the jury doesn't even see because of the lack of animation and technical presentations in the courtroom," Chrisman says. Inspired by this realization, he created CourtRoom Presentations, Inc., which offers litigation support services for trials and mediations. Because of his lack of business skills, Chrisman admits managing his own firm was--and still is--a challenge. But thanks to his knowledge of the courtroom and evidence, Chrisman and his staff of less than five have been able to provide technological presentations that have amazed the prosecution and defense. In 2007, CourtRoom Presentations only lost two of the 32 cases it was involved in and helped attorneys win $100 million in jury verdicts. After almost three years in business, Chrisman plans to market his services outside of California and forecasts revenues of $500,000 for 2008. Like Chrisman, David Matheson, 45, was able to apply the knowledge gained from his police days to his entrepreneurial venture. 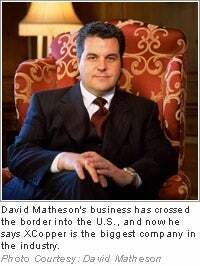 In 1988, after four years of upholding the law in Toronto, Canada, Matheson founded XCopper Legal Services Inc., a paralegal firm specializing in fighting traffic tickets and other offenses. While he loved being a policeman, he was fired for taking security work on the side. Matheson says he doesn't regret the four years he spent holding a badge. In fact, being an officer is what led him to start the business he owns and manages today. Last year, the 52-employee company boasted sales of $10 million. "In terms of lifestyle, this one is obviously better," says Matheson. "The life of an officer was getting to me. The 'two o'clock knock' was the worst--telling parents their child wasn't coming home." Though many ex-cops who went on to start their own business stayed in the realm of security tactics, private investigating or SWAT training, some embarked on a completely different career path. Scarda, a 20-year NYPD veteran, was faced with the choice of continuing with the force and receiving a better pension or pursuing her dreams. After weighing her options, Scarda, whose husband is also an entrepreneur, decided to take the risk. "It was pretty scary. But there were too many other things I wanted to do," she explains. In addition to her career aspirations, Scarda says family was another key factor that prompted her to make the change. When she realized her family of four was eating fast food more often than home-cooked meals, she looked into the Super Suppers franchise and decided to pursue a store of her own in Long Island, New York. She's now going to school at the Integrated Institute of Nutrition in Manhattan to become a holistic health counselor. And just two weeks ago, Scarda made her debut as a stand-up comic at the Brokeridge Comedy Club; her next show is in December. Scarda says comedy is just a hobby, but it's something she wouldn't have had time for when she was a sergeant. 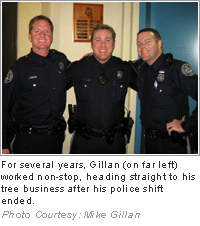 Entrepreneur Mike Gillan also suffered from a lack of free time during his days with the Lower Merion Police Department in Lower Merion Township, Pennsylvania. The 36-year-old juggled his seven-employee company, MG Tree, for several of his 10 years with the department. But by the time his second son was born, he knew that managing a company, working for the force and maintaining a family life was only going to get tougher. So in September 2006, he quit the department to focus solely on his tree service. Taking the leap has proved to be a successful move, both personally and financially. The tree removal and care company, MG Tree, is projecting $1 million in sales in 2008--double-digit growth from this year. "The company was always successful, but it didn't really take off until I quit the department," says Gillan. "And my quality of life has improved like you wouldn't believe." Now, looking back at their experiences as law enforcement officials, Chrisman, Matheson and Gillan agree that their lives as entrepreneurs have brought them greater fulfillment than their policing days. "MG Tree has been more fulfilling for me since I've done it all myself. I'm proud of that," says Gillan. Scarda, however, disagrees. She says her role with the NYPD has still been her most fulfilling job to date. 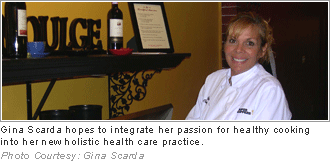 But she hopes her next business venture into holistic health care will change that.